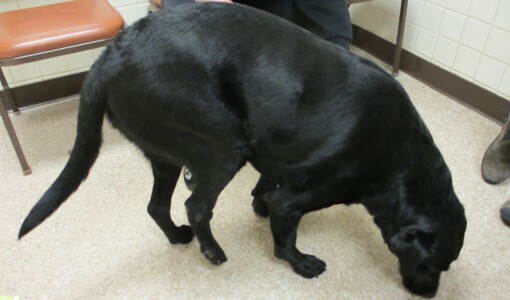 Ruby, a two-year-old female spayed Labrador retriever had a traumatic diaphragmatic hernia repair and a shearing wound/right tarsocrural instability stabilized with an external fixator. Over the next month, the tarsal injury required debridement, treatment for infection, and bandage changes. Eight weeks after her injury, a full thickness mesh skin graft, harvested from her lateral abdomen, was placed atop the granulation tissue on her right tarsus. One week later the external fixator was removed. She had only partial weight bearing of the right hind leg, and once released from exercise restriction she began to run and play Frisbee on three legs. She remained three-legged lame despite rehabilitation therapies for the next four months when she was referred to the Pain Consultation and Referral Service at Cummings School to explore alternatives to amputation of the limb. MTPs are hyperirritable foci within skeletal muscle that are found along taut bands of muscle. Histologically, they are reportedly nodular, rounded, and contain large diameter muscle fibers. They are said to form in response to a variety of physical stimuli, such as eccentric contraction, deep intramuscular injections, limb immobility or muscle compression by bandages, or scars, from local muscle ischemia and other metabolic conditions. There are many excellent reviews of the etiology and pathology of trigger points. The most important things to understand about MTPs are: 1) they may arise in response to pain; 2) they may be a cause of significant pain; 3) they may also be responsible for muscle dysfunction, including weakness; and 4) effective treatment of MTPs may eliminate pain and restore muscle function. Myofascial pain accompanies a number of clinical syndromes in dogs, including osteoarthritis, IVDD, post-surgery, trauma, or following protracted immobilization. The author has found that, when a specific cause for pain is not discernable (i.e. joint instability), or successful surgical intervention fails to resolve pain and restore function adequately, and conventional pain relievers are not effective, that examination and treatment of MTPs may in many cases resolve, or be associated with resolution of pain. Canine sports medicine and rehabilitation professionals are versed in the theory and application of treatments for MTPs; however some typical rehabilitative therapies, such as passive stretch and aqua therapy, may exacerbate MTPs and fail to resolve pain and dysfunction unless MTPs are also treated. What were potential causes of Ruby’s MTPs? She had her tarsus immobilized for 9 weeks, which prevented her from extending the stifle and hip normally. She had a tight, adhered scar from her skin graft donor site that very likely “grabs” her when she moves, and scars may contain entrapped nerves/neuromas that fire abnormally when tugged on. She was an enthusiastic athlete who was, once released from exercise restriction, playing extreme Frisbee, running in sand and jumping in and out of her pool, thus re-instigating MTPs by causing eccentric contraction (think “pogo-stick”) of her muscles. Factors A and C are well-recognized causes of chronic pain, characterized by central sensitization – abnormal impulse generation and propagation by the central nervous system. Factor B favored contracture and D simply acted to habitually “reset” some of her trigger points. What types of treatment for MTPs can be considered? The medical literature for MTP related pain and dysfunction contains several possible modalities for treating trigger points. Many of them will have similar bases – the muscle knots and resulting taut, restrictive bands of muscle are influenced by physical means such as massage, careful stretch, low level laser, therapeutic ultrasound, shock wave, acupuncture and trigger point dry needling. However, it is necessary to know “where to treat,” as random application of physical methods will yield random results. Trigger point dry needling, while performed with acupuncture needles, differs from conventional acupuncture in that the points treated are found by a process of palpation and consideration of muscle forces/range of motion. Dry needling can produce immediate and dramatic increases in muscle length and function. Medications, while useful in reducing the pain perceived due to MTP and dysfunction, are seldom able to achieve resolution of trigger points. However, in Ruby’s case, the course of gabapentin and amantadine were instituted because, after four months of non-weight-bearing, and nearly 12 months of chronic pain, the contribution of the now quite pathological state of her nervous system in maintaining muscle dysfunction was deemed to be a perpetuating factor as well. McPartland, John M., and David G. Simons. “Myofascial trigger points: translating molecular theory into manual therapy.” Journal of Manual & Manipulative Therapy 14.4 (2006): 232-239. Wall, Rick. “Introduction to Myofascial Trigger Points in Dogs.” Topics in companion animal medicine 29.2 (2014): 43-48. Wright, Bonnie. “Management of chronic soft tissue pain.” Topics in companion animal medicine 25.1 (2010): 26-31.